The holiday season continues in full swing here in Petersburg with more concerts, a holiday fun run, the annual Audubon Christmas Bird Count, and wonderful hospitality from new friends. 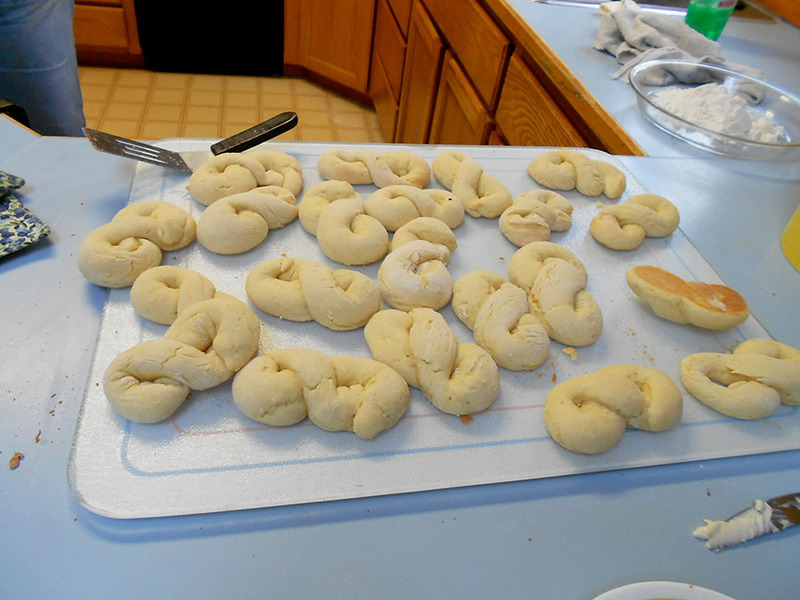 We were walking down the street after working out at the community center the other day when we were gently herded into the home of new friends Grant and Lila for some conversation and some fresh-from-the-oven Norwegian kringle. The kindness and warmth of the people we’re meeting here is remarkable, and we’re enjoying learning more about the area and about the culture. Petersburg really lives up to its nickname of “Little Norway” at the holidays, with the tradition of Julebukking taking center stage this week. Julebukking is an old Norwegian tradition that was originally pagan in origin, but was later adapted by the Christians. In its purest form it’s a little like Halloween at Christmas where people would dress up in costume and visit their neighbors, and the neighbors had to try and guess who they were. Food and drink featured prominently. It’s a variation on the idea of a holiday open house, and here in Petersburg it’s practiced by the various businesses around town (and you don’t have to dress up in a costume!). There are so many local businesses hosting Julebukking that the paper had to publish a schedule of which places are hosting on which days, culminating with 10 different places today. We finally came home early today – utterly Julebukked-out – but it has been a great way to get to know people in town and we’ve had a ball. The holiday feeling here is old-fashioned – festive and happy. People greet each other on the street and hearty wishes of “Merry Christmas!” are everywhere – between friends and strangers alike. 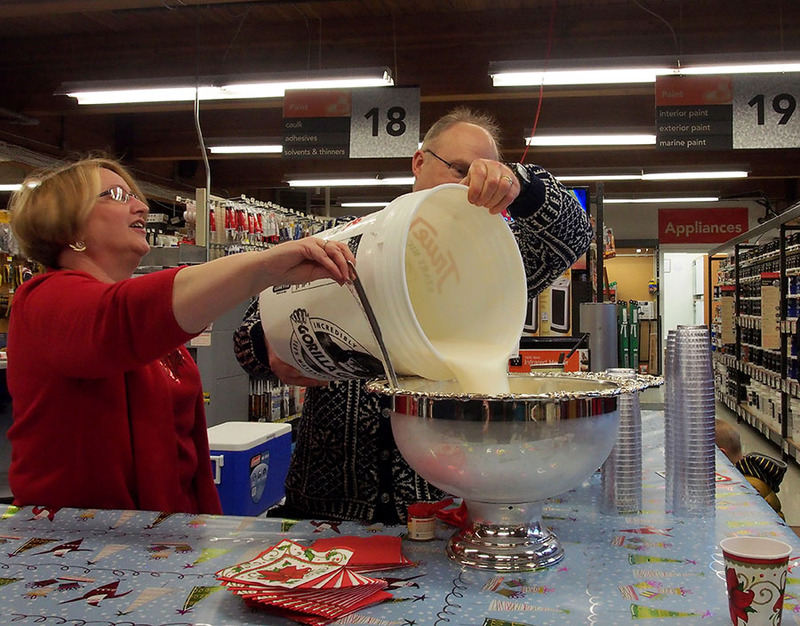 The best of the Julebukking was today at the hardware store where they had a nice spread of noshes, punch, and the feature: “Moose Milk”. 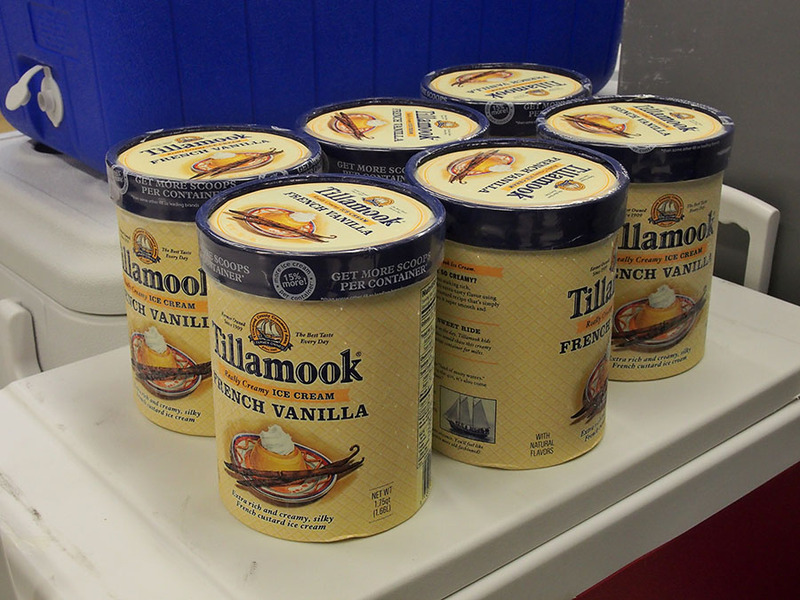 “Moose Milk” starts with this: To which you add some liquor named “White Christmas”… And then you put it into the paint shaker… And when it’s sufficiently shaken (not stirred), you pour it into an elegant bowl, and serve it with a dash of nutmeg on top! 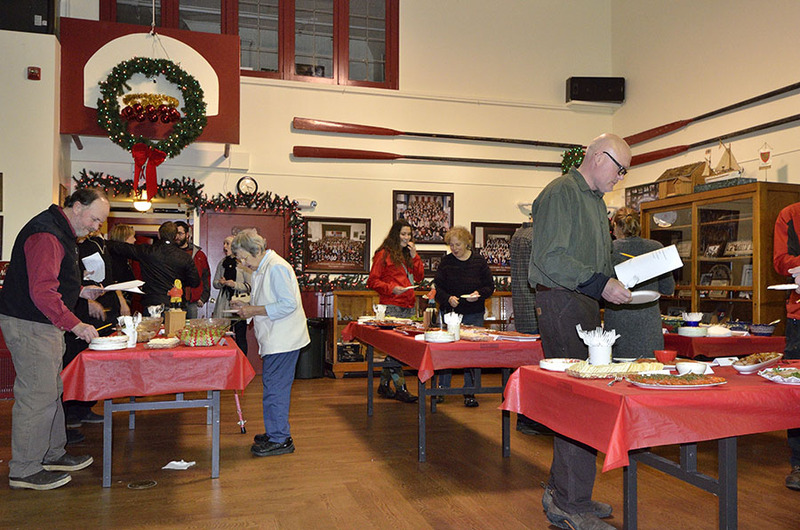 Monday night was a Community Concert where 16 different groups or individuals played a musical instrument and/or sang holiday songs. To see that many people offer to share their time and talents was heartwarming enough, and most of the performances were extremely good. Our favorite was a duet by Lila and Grant singing an old Norwegian carol, along with the story of how they learned the song and met as youngsters in Minnesota. Saturday was our day for the Christmas bird count for the Audubon Society, and I joined a valiant group of volunteers on a cold, rainy, windy day – not the best for seeing a lot of birds. The scoters are plentiful in the harbor and we’re starting to see some long-tailed ducks, and I’ve been assured that many more are on their way here for the winter soon. 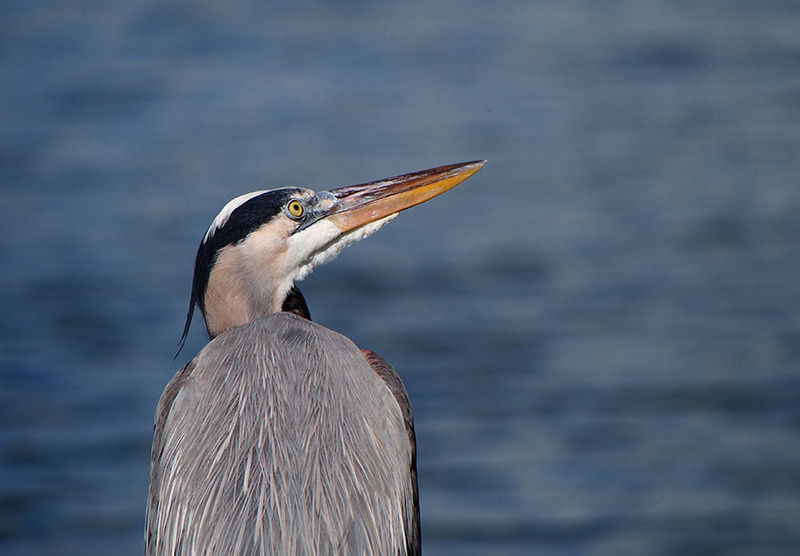 I was on a little team with a local bird expert currently working on her PhD and a retired Alaska State wildlife biologist – which was fantastic. We counted the trumpeter swans, buffleheads, mergansers, loons, pine siskins, etc. I got a nice tour of some good hiking and bird watching spots on the island and I learned a lot from them both – well worth enduring the cold wet weather! We heard our names on the local radio station (KFSK.org) today announcing that we won the Christmas Light Contest in the “boat” category. There was only one other entry in our category, but a win is still a win! 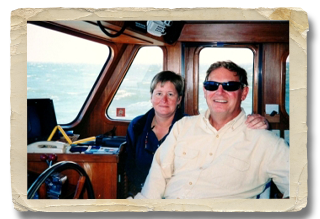 Jim gets all the credit – he’s the one who does such a nice job putting lights all around the boat and a big red ribbon on the bow. 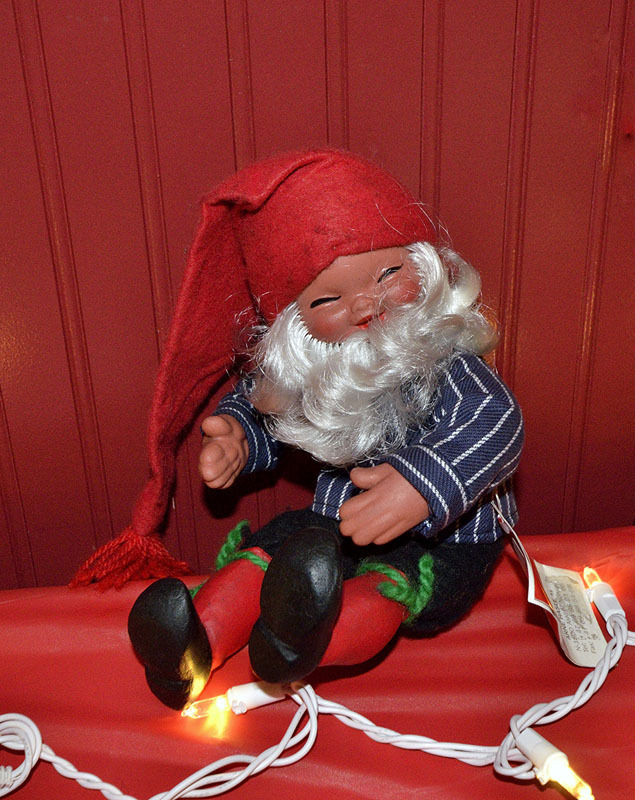 We wish you all a very Merry Christmas, or as the Norwegians say “God Jul”! Today is the Winter Solstice – the shortest day of the year and the first official day of winter. Here in Petersburg the sun will rise in a little while at 8:29 and it will set at 3:13 this afternoon. It feels odd to see the daylight end so early in the day – we keep feeling like it’s time to start fixing dinner when it gets dark and we have to look at the clock for cues about where we are through the day, but all the Christmas lights around town make the dark hours look sparkly and pretty. The good news is that starting tomorrow the days will get longer by a noticeable amount – 5-7 minutes per day until the days are crazy-long once again. The bad news is that the holidays will be over in a couple of weeks and many of the pretty lights will be put away until next year. 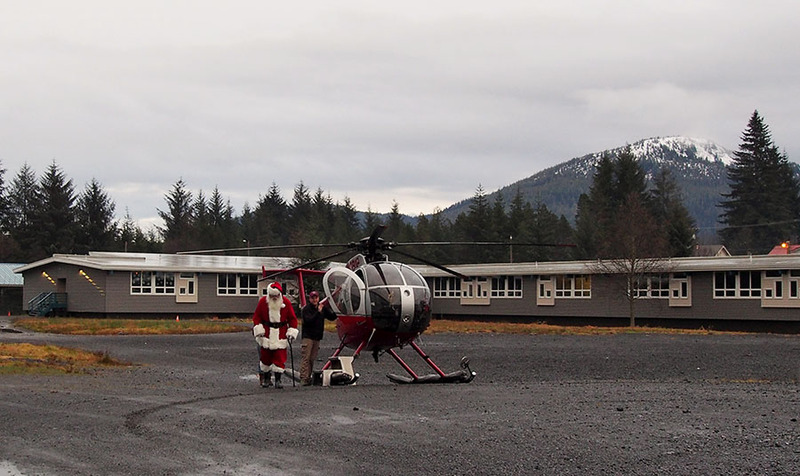 This is the second installment of “Life in a Small Alaskan Fishing Town”, and today’s post continues with Santa arriving by helicopter at the Community Center children’s party last Saturday. He needed a little extra help getting out of the helicopter and he was walking with a cane – apparently he tripped over an elf recently, but he assured us that he’s on the mend and he’ll be in good shape for The Big Day! Last weekend was also the bi-annual presentation of the Nutcracker by the Mitkof Dancers (Mitkof is the name of the island we live on). 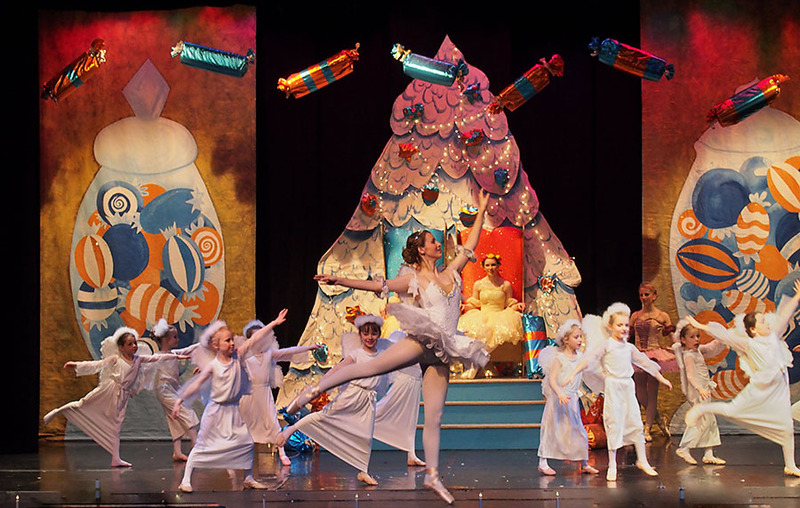 The Nutcracker was put on by 140 dancers from town, including 30 boys, and the ages ranged from 3 to early 20’s, plus one middle aged gentleman who danced Herr Drosselmeyer. It was OUTSTANDING! The costumes were excellent – elaborate, creative, and they fit each child perfectly. The sets were lovely, and the dancing was very good – at least a dozen dancers were in toe shoes. We were completely blown away by the entire production, and it was a grand way to mark the holiday season. My favorites were the little ones. 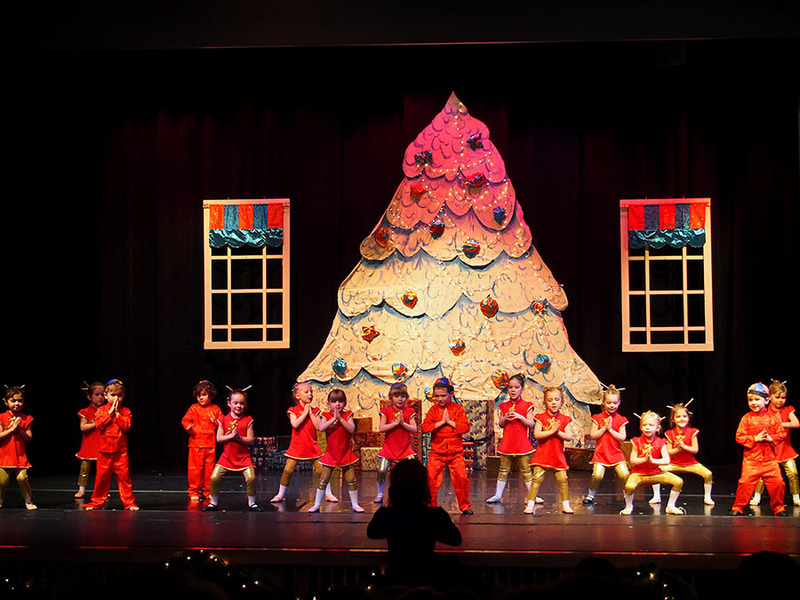 The snowflakes were 3 years old… And these little sugar plum fairies were only a little older… Then we had “little Chinese tea”… There was plenty of serious dancing and it was very good – the Rat Queen was particularly talented, yet they still found ways to include the younger dancers. These tiny gingerbread gals melted our hearts, and one girl was like a deer in the headlights just standing still. Her friend’s attempts to get her back into the dance had us crying, laughing so hard. Every performance was sold out and the crowd was packed with more than just the parents of the dancers. 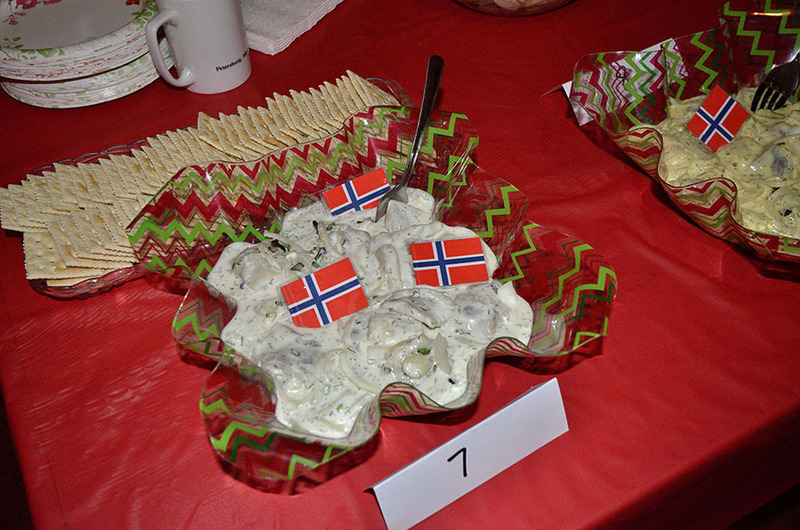 Punch and Norwegian cookies were served in the lobby afterwards, and we left feeling uplifted, festive, and happy. Next up: Julebukking. Stay tuned! Welcome to the first installment of: Life in a Small Alaskan Fishing Town… specifically “Little Norway” – Petersburg. We missed a few interesting events while we were traveling, but we returned to a full calendar heading into the holiday season, and first up was the 40th (yes – 40th!!!) 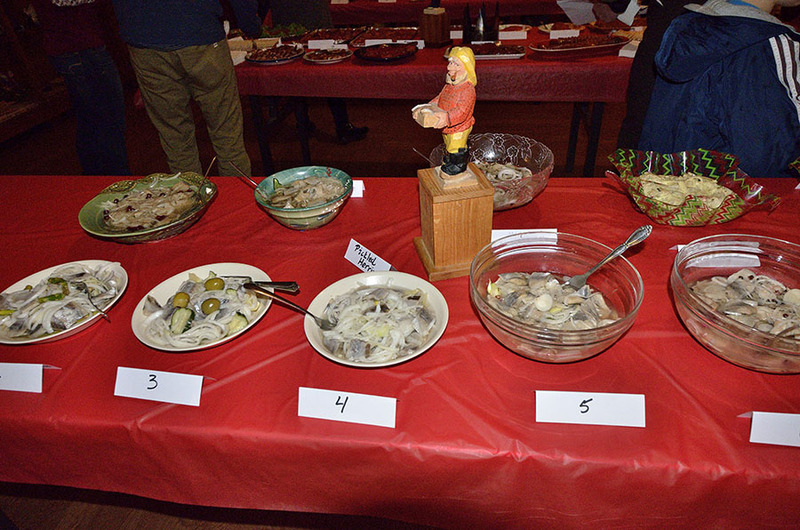 Annual Pickled Herring Contest at the Sons of Norway (where I am now a member). With actual Norwegians and a Swede in my family tree I’m definitely getting in touch with some long-neglected roots and it feels pretty darn good. 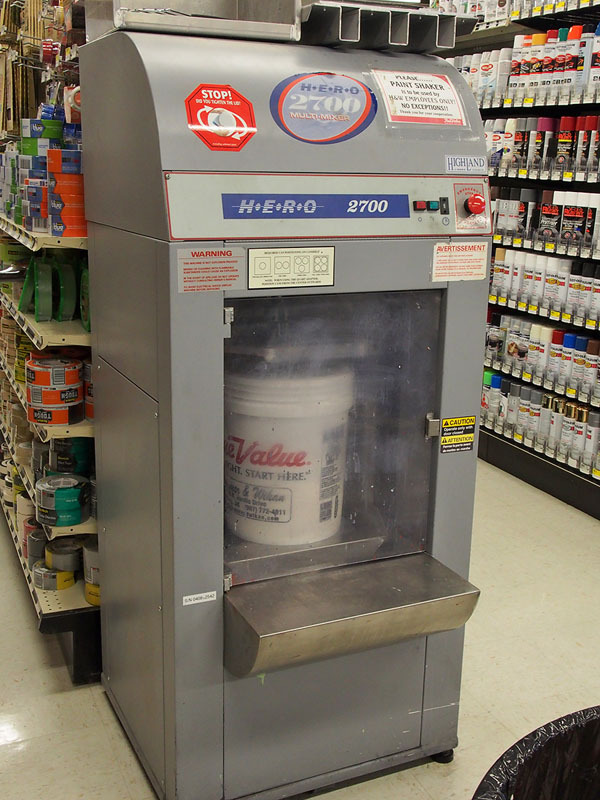 I started making snarky comments about the idea of an actual contest about pickled herring, but I was quickly sorted out by my Danish friends in Maryland who informed me that pickled herring is a WONDERFUL THING, to be enjoyed, appreciated and cherished, and maybe they would look for a decent airfare to come out here and join in the fun. I’m learning! So despite the fact that I do not eat seafood or fish of any kind (I really don’t like it though Jim does) we headed over to the Sons of Norway Hall to expand our cultural horizons. By the way, I’d like to point out that the Sons of Norway Hall in Petersburg was built in 1912 and it has been in continuous use for over 100 years. 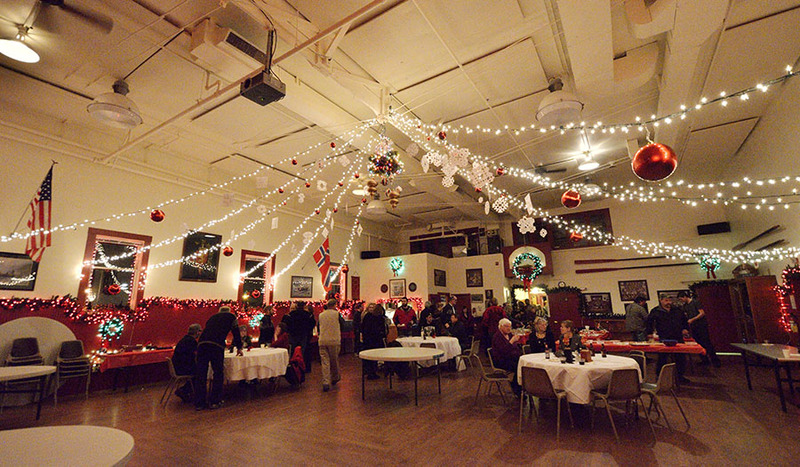 It was beautifully decorated for Christmas, creating a lovely setting for the Big Contest. 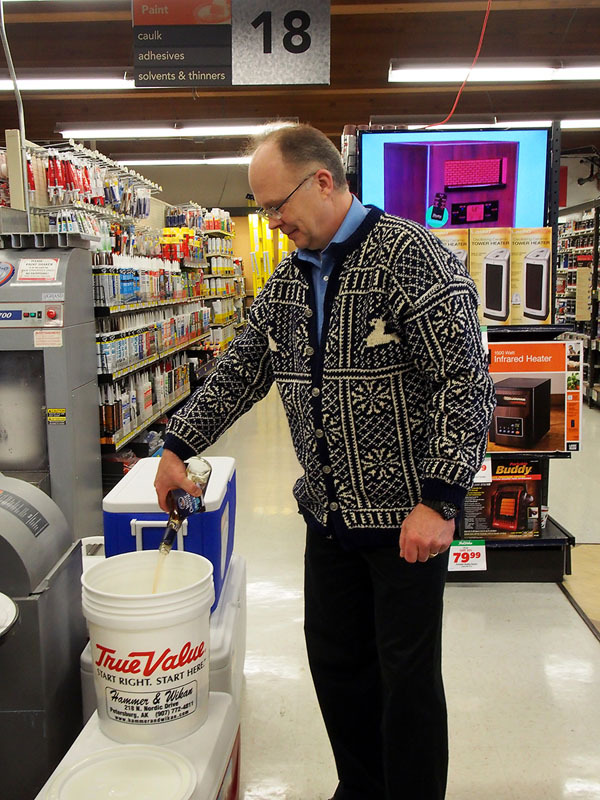 I think there were about 150 people in attendance, and the number of people wearing beautiful Norwegian sweaters was staggering! The nickname “Little Norway” is more than appropriate for this town. 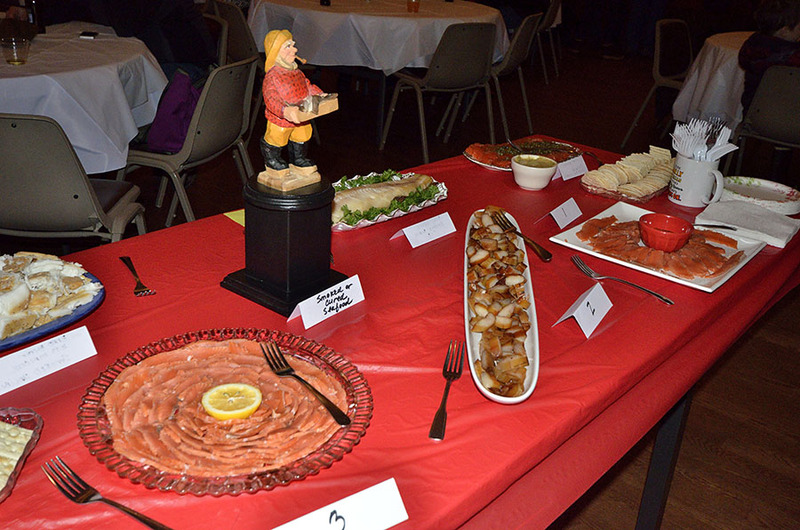 Tables were laid out for each type of entry: Pickled Herring, Smoked Salmon, Smoked or Cured Fish, and Pickled Seafood. 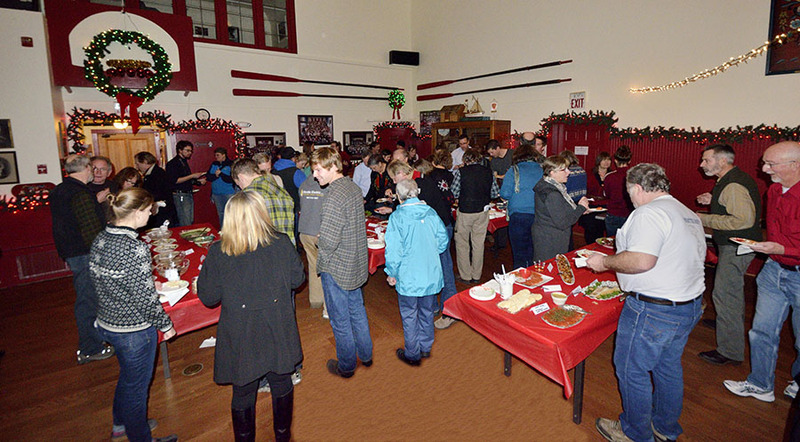 There was also a table with appetizers and sweet treats so people had things to nibble on while the contest entries were judged. Given that 99% of the people attending and competing have been involved with commercial fishing to some extent, the competition was stiff. The judging took a long time, despite an earlier start than previous years to try and keep things moving along. The judges really took their time… And eventually the winners in each category were announced. 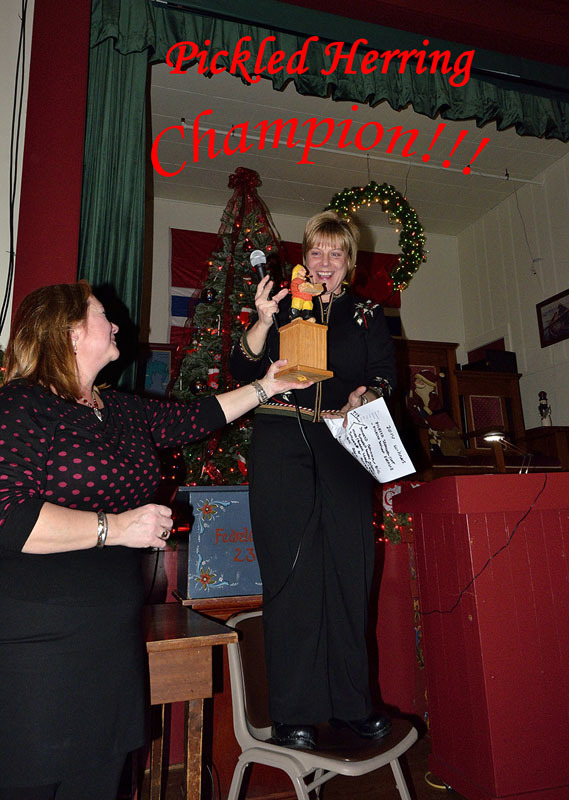 We were proud to see our Harbormaster Glo win the coveted Pickled Herring award after 23 years of entering the contest! After waiting patiently for about an hour the crowd was finally allowed to eat the entries, and it didn’t take long for the platters to be picked clean. We had a good time and met more people from town, including the President of the Sons of Norway. 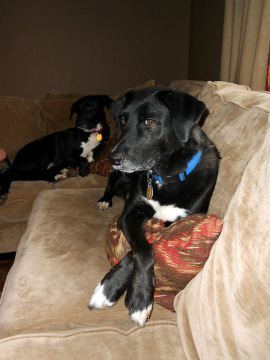 In fact, when we first arrived I wanted to try and find her to introduce ourselves as new members. Coincidentally she was near the door and we met her right away, and I kept thinking about that good bit of luck… until I thought about it some more and realized that we were the only strange faces who came through the door – so we must be the new people in town. Duh! 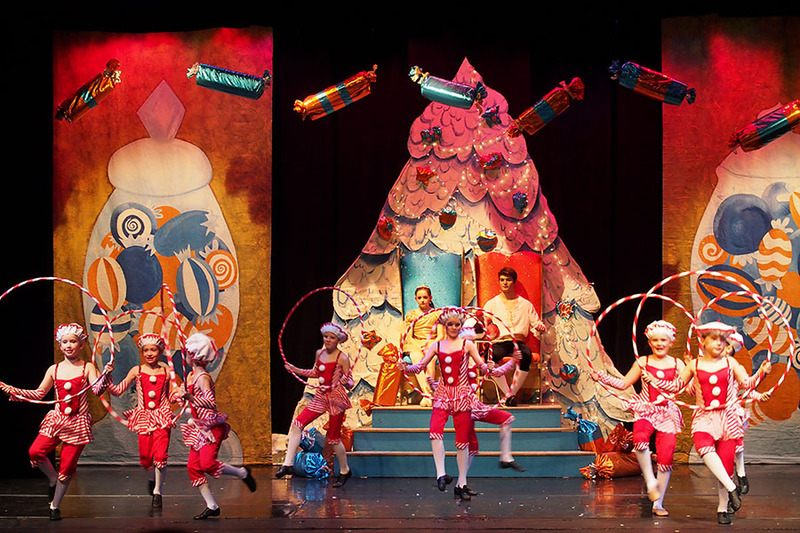 Next on the calendar is the Nutcracker put on by 140 dancers from this town of about 2000 people, followed by the Julbord Feast at the Sons of Norway and the school band concerts. 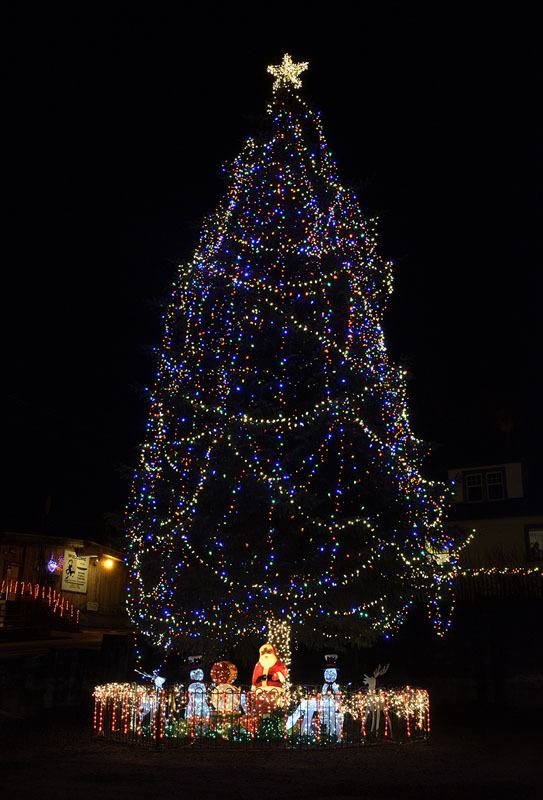 Petersburg really does the holidays in a big way, and we love it! This is the last post I need to get the blog caught up with real time – I’ve been behind for quite a while, and new things to blog about are piling up as we experience the Holiday Season in a Small Alaskan Fishing Town (which is really awesome, just to give you a hint). After zooming down to Washington to retrieve our car and ferry it (literally) back here to Miktof Island in October, we quickly had to get ready for a major “road” trip (which involved a bit of flying to get things started). We were heading back to the east coast for a good friend’s wedding, to visit family and friends, and to spend Thanksgiving with Jim’s Dad. It takes two days to fly from Petersburg to The Rest of the World – we flew to Seattle the first day, and then on to Baltimore the second day. Flying is tricky these days since we had to keep within the 50 lb limit for our one checked bag each, and we needed clothing for a month that included: wedding clothes, northern clothes, and Florida clothes, plus enough camera gear and knitting to keep me from having withdrawal symptoms. 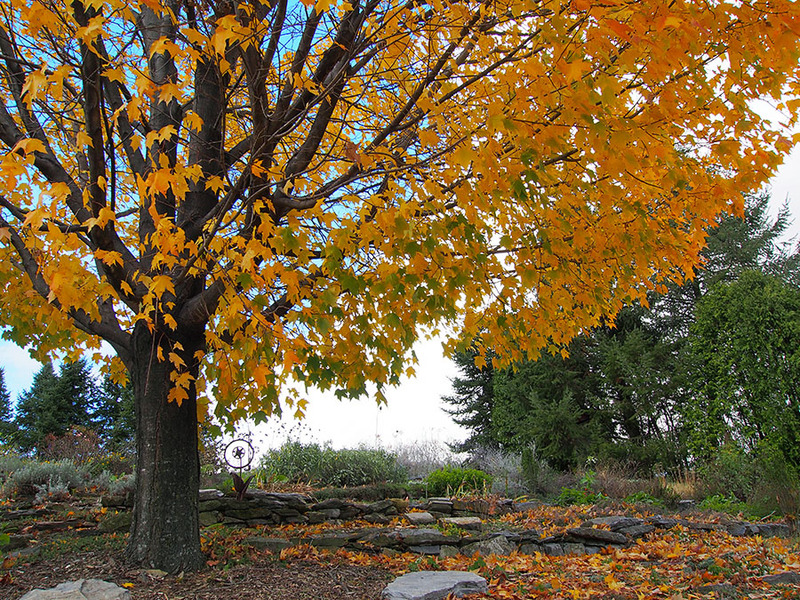 The wedding was fantastic, and it was a perfect, beautiful late fall day with some trees still in full color. We packed a ton of visits into a short amount of time but there were a number of people we wanted to see that we just didn’t have time for, which is frustrating. We ran ourselves ragged and Jim ended up with a sinus infection, but we had fun despite the crazy schedule we made for ourselves. We spent a little time with my brother and his wife and their dogs – this one is Frankie. I got to watch my beloved, heart-breaking Giants with my brother, and laugh because we made many of the same comments at the exact same time through the game. 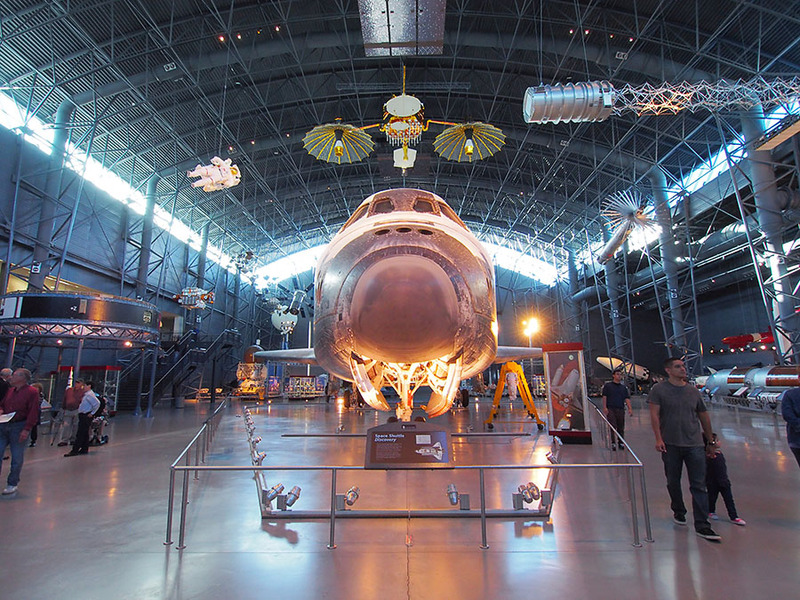 We vowed to take one day of our time in the Washington DC area to enjoy a museum – there are so many wonderful ones, and we chose the Udvar-Hazy Center – an extension of the Smithsonian’s Air and Space Museum that’s located next to Dulles Airport. It has been on our wish list for years, so we finally went… and it was outstanding. 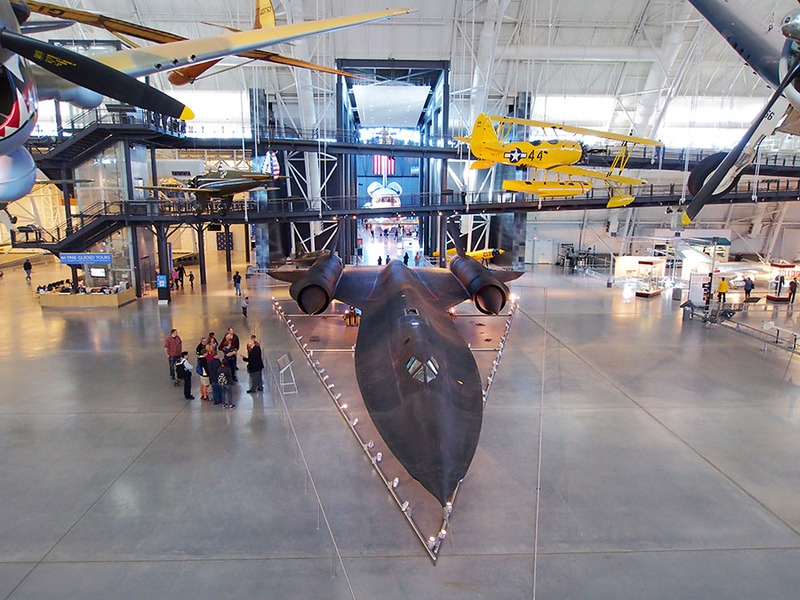 The first aircraft you see, front and center, is the SR-71 Blackbird. It was so exciting to be able to get so close to see it, as well as the extensive collection of planes throughout the history of aviation. Jim loved seeing the F-100 and F-105s – which he worked on when he served in the Air National Guard in Vietnam. 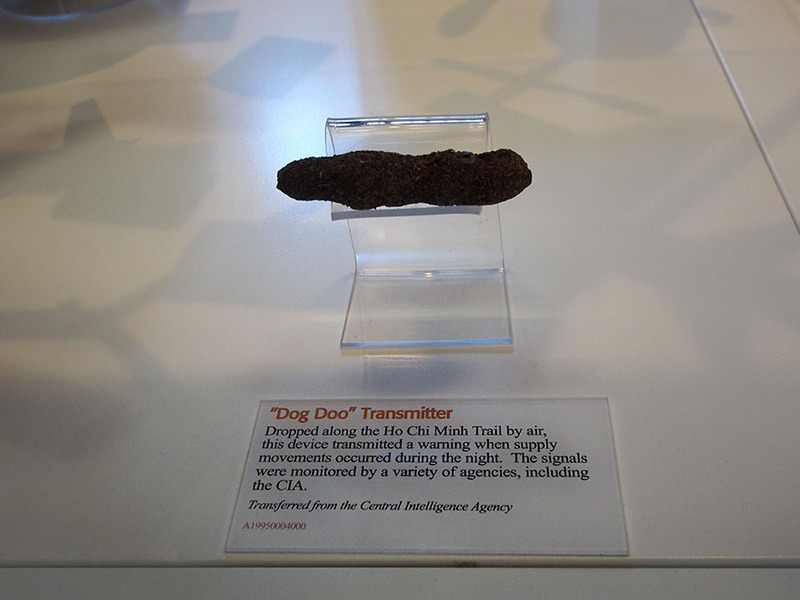 We also got a kick out of some of the displays, particularly this one… an example of out-of-the-box thinking. 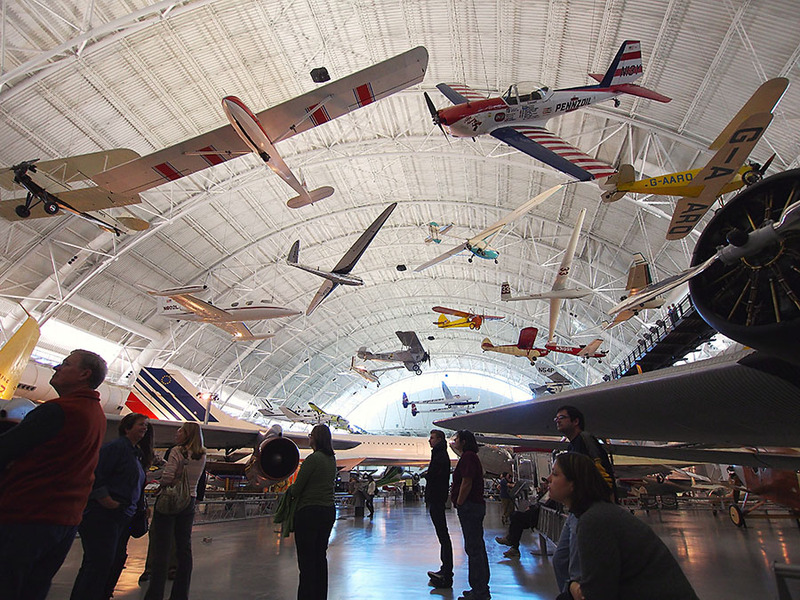 The number and variety of aircraft was staggering – from the actual Enola Gay to the Concorde, small planes and big planes, modern and antique. There was more than we could absorb in one visit, so we’ll definitely go back the next time we’re in town. 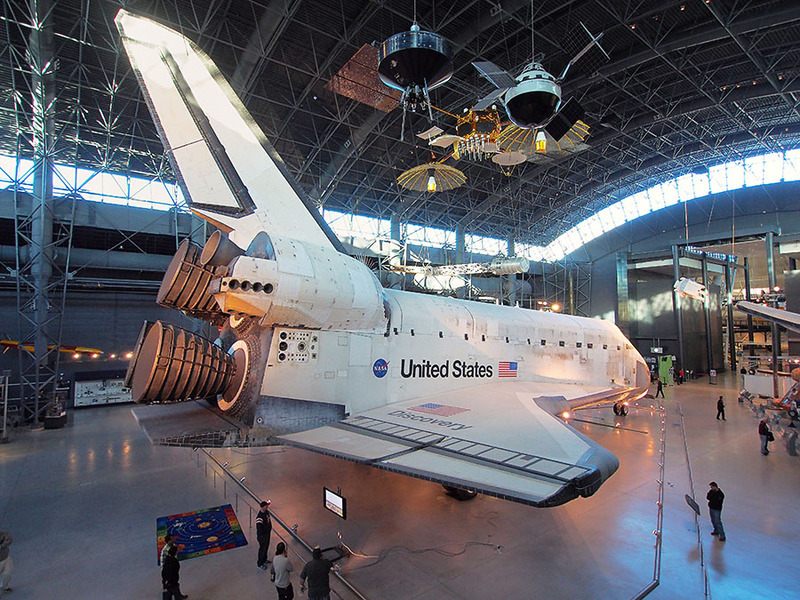 My favorite was the Space Shuttle DISCOVERY. I was at Cape Canaveral for her maiden launch in 1984, and I have a little flag that flew on that mission – so it was special to see her once again. 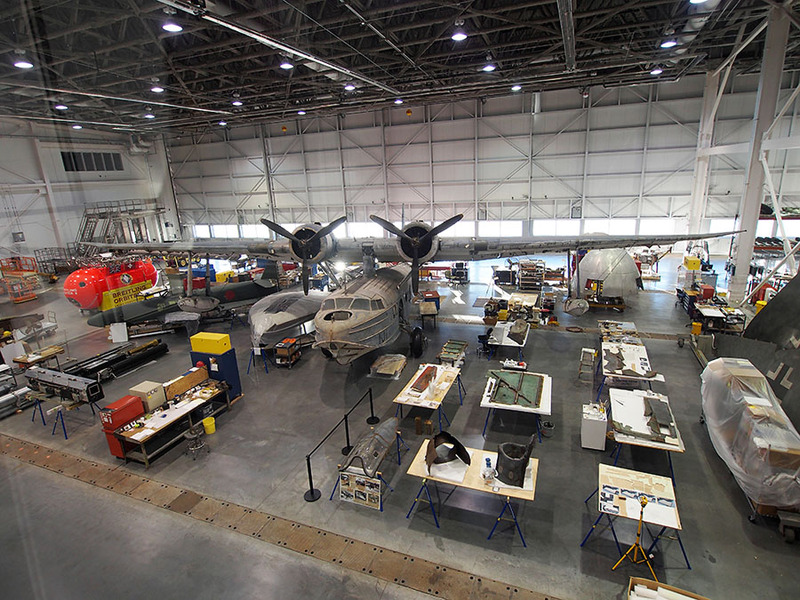 We could see into the hangar where more aircraft were being restored, and we were just so impressed by the magnitude and quality of the museum. We got to see one of Jim’s brothers and and one of his sisters, as well as a niece and nephew and all the spouses – we always have a lot of laughs. 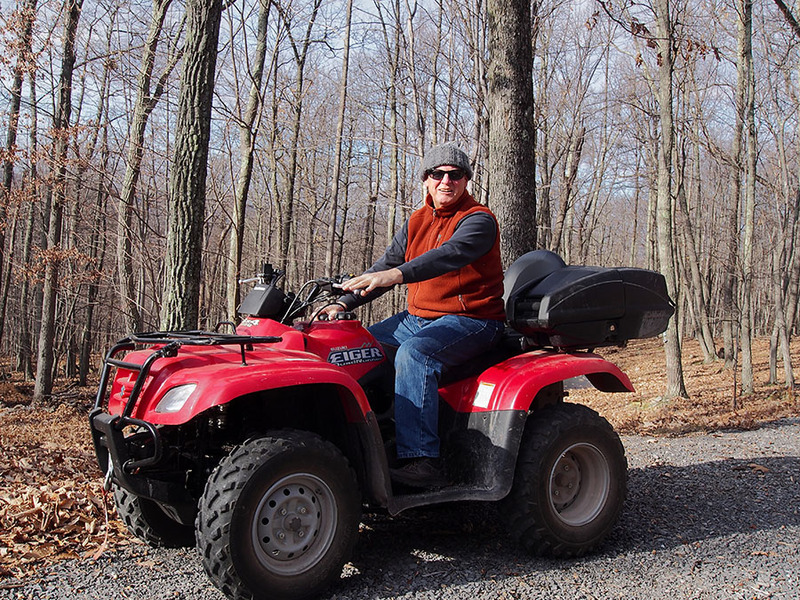 We visited friends at their weekend house in West Virginia and had fun splitting logs, running around on their ATV, and catching our breath after too much visiting and eating and sitting around. From the chilly mid-Atlantic we drove down to sunny Florida to see Jim’s Dad for Thanksgiving. In the “small world” category, we made the happy discovery that our Canadian boating friends from the Northwest were in nearby St. Petersburg on their RV, so we met them for lunch and a very happy reunion. Unfortunately Jim’s sinus infection was still hanging on, and the new medication that his doctor prescribed didn’t agree with him, so he ended up skipping Thanksgiving dinner since he was still pretty wobbly… poor kid. He took another day to rest and was feeling well enough to go visit some other boating friends who just crossed the Gulf of Mexico from Florida’s panhandle. We strolled around Tarpon Springs and ate wonderful Greek food and toured around in the dinghy. 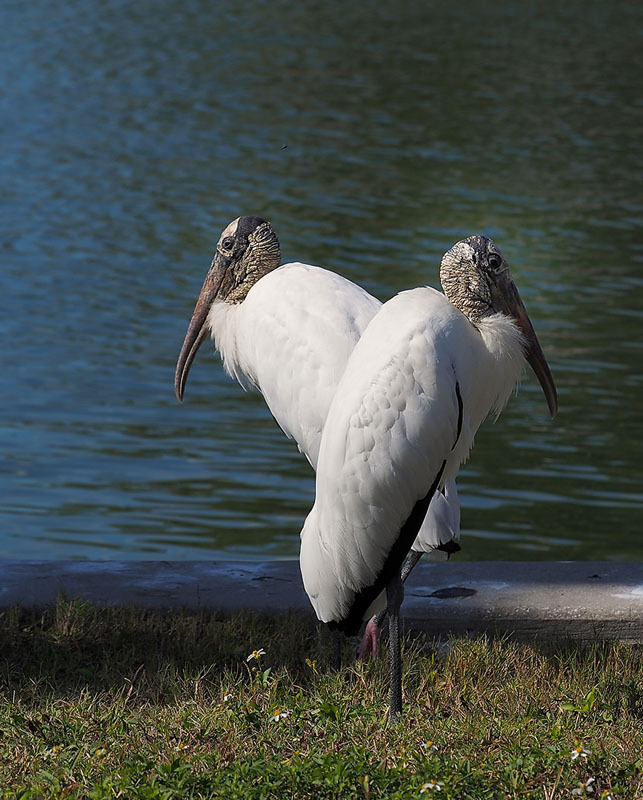 My friend Carol is my best birding and photography buddy, and we got to see the pelicans and the young wood storks. They have faces that only a mother could love, but it’s neat to see the feathers on the edge of their wings – a pretty iridescent green-black. 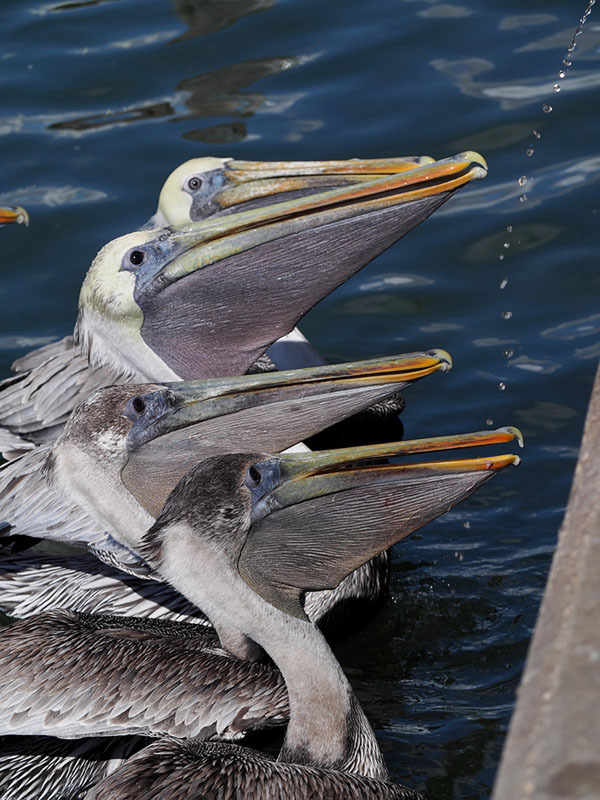 Some snowy egrets and a few blue herons were hanging out around a fish cleaning table, and the pelicans were smart to sit beneath the table’s drain pipe. The warm sunny Florida days were lovely, but we’re acclimated to Alaska weather now and sometimes it felt a little too warm. 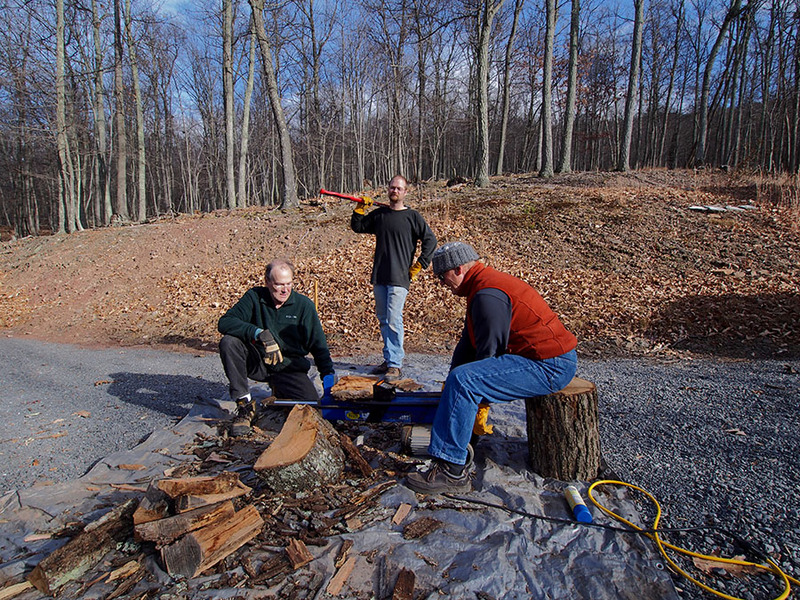 Two years ago we would be in jeans and long sleeves at 70 degrees… now we’re comfortable in shorts. 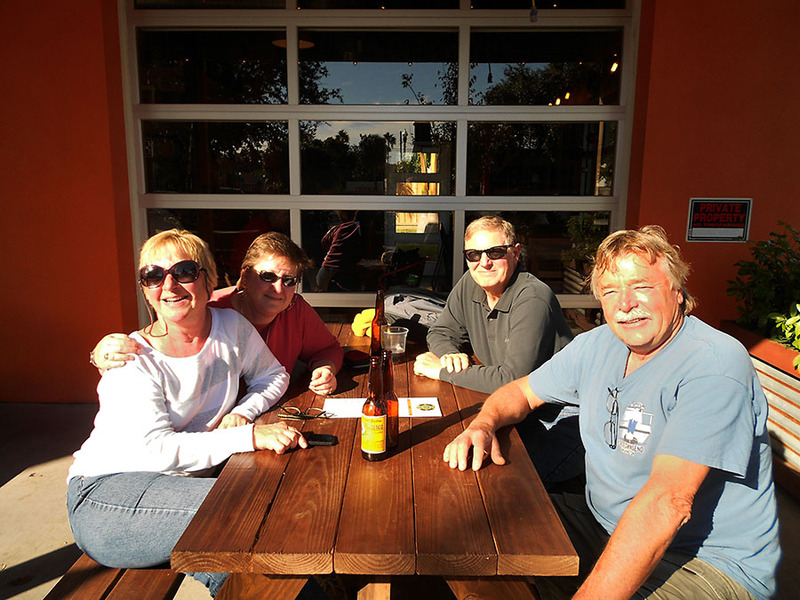 We saw another of Jim’s brothers and another sister down in Florida, but ran out of time to see some of my Florida cousins. Sunny and Jim spoiled us with their usual killer hospitality, and we enjoyed the time we spent with everyone very very much.